Yellowstone National Park was established by Congress as the first national park in the United States (and the world) on March 1, 1872. An array of people helped foster more parks, including James Mason Hutchings (a magazine publisher who was one of the first people to promote Yellowstone); the naturalist, John Muir; Marjory Stoneman Douglas (of River of Grass Everglades fame); and Stephen Mather, a wealthy businessman and philanthropist who would eventually use his personal fortune to help create the National Park System. On August 25, 1916, President Woodrow Wilson signed the act that actually created the National Park Service. Today, vacationers continue to flock to national parks. In 2009, more than 285 million people visited national parks and other units of the National Park Service. The NPS now has a total of 392 units, including 58 national parks, 122 historical parks or sites, 74 monuments, 24 battlefields or military parks, 18 preserves, 18 recreation areas, 10 seashores, four parkways (like the Blue Ridge Parkway, which is celebrating its 75th in anniversary in 2010), four lakeshores, and two reserves. The NPS has some sort of unit presence in 49 of 50 states (Delaware is the sole exception) and also helps administer dozens of affiliated sites, the National Register of Historic Places, National Heritage Areas, National Wild and Scenic Rivers, National Historic Landmarks, and National Trails. The National Park System covers more than 84 million acres, with Wrangell-St. Elias National Park the largest unit at an incredible 13.2 million acres and Thaddeus Koxciuszko National Memorial the smallest at just 0.02 acres. *Everglades: This sprawling South Florida national park was created in 1947 to protect the wonderful landscape from drainage and sprawl. It was expanded in 1989 by an act of Congress to help with what has been called the worlds largest restoration project. Highlights here include: boardwalk hiking and nature viewing (including alligators and American crocodiles); camping; a variety of ranger-led nature tours and activities (world-class birdwatching); and canoeing the Wilderness Waterway. *Acadia: Located on the coast of Maine and the first national park established east of the Mississippi, Acadia is home to the highest mountain on our nations Atlantic coastline. Hiking to granite peaks or biking along historic carriage roads are highlights here. *Grand Canyon: This national park just may epitomize the grand nature of the NPS. At 275+ Colorado River miles in length, up to 18 miles in width, and a mile deep, this is nature on a grandiose scale. The much more visited South Rim has great lodging, hiking, the popular Grand Canyon Railway, and other activities (like the famed mule trips down to the river), while the much quieter North Rim (just 10 miles away as a raven flies, but 215 by road) features a small village with seasonal lodging and activities. *Yosemite: John Muir said, It is by far the grandest of all special temples of Nature I was ever permitted to enter. This is nature with a capital N, High Sierra hiking, stunning granite cliffs, Sequoia groves, and a valley filled with wildlife. 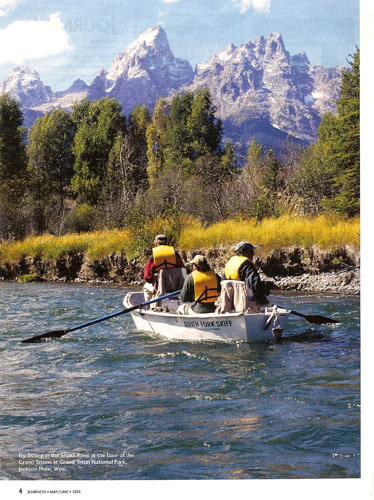 *Grand Teton: Another grand-scale park that is known for world-class hiking and climbing. Grand Teton's views alone of jagged peaks and deep canyons arise abruptly from the valley floor of Jackson Hole and definitely a National Park worth visiting. *Yellowstone: From Old Faithful to old lodges still in use, Americas first national park is still a lasting favorite and one used for land-use models worldwide. Wildlife and scenery are in abundance in this varied park that deserves a stay of many days. The Yellowstone Association Institute has a wide variety of nature-oriented programs for interested visitors. *Glacier: Sharing national park awe with Canadas Waterton Lakes National Park, Glacier National Park is part of the dual national park International Peace Park World Heritage Site. The area is one of very few in North America where all the native carnivores (wolves, bears, elk, and cougars) still survive. Glaciers 100th anniversary as a national park is 2010. 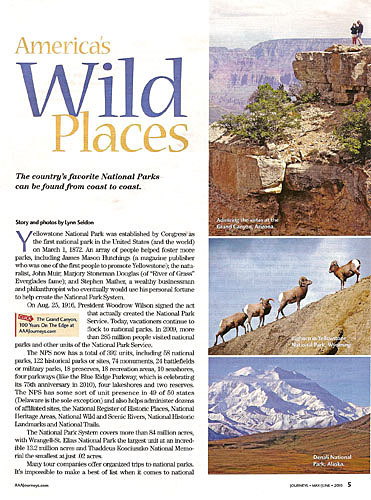 For more information about the above national parks and others, visit www.nps.gov. Ken Burns' 2008 documentary series, The National Parks: Americas Best Idea, explored the history and current state of some of the most special places in the United State. Set against only-in-America breathtaking backdrops, it was filmed over the course of more than six years and from the Everglades to Denali. "Our film celebrates the beauty of these parks and the vision and foresight of the men and women who made sure that this land would be preserved, Burns said. The 12-hour, six-part series (which can still be seen on PBS) was co-produced with Burns long-time colleague, Dayton Duncan who also wrote the script and is the author of the companion book published by Alfred Knopf. *Habitat protection for more than 375 threatened or endangered species. *27,000 historic and prehistoric structures. *More than 100 million museum items (including George Washingtons inaugural coat and Carl Sandburgs typewriter). *The worlds largest carnivore (the Alaskan Brown Bear). *The worlds largest living things (Giant Sequoia trees). *The highest point in North America (Mount McKinley, in Denali National Park). *The lowest point in the western hemisphere (Badwater Basin in Death Valley National Monument). *The longest cave system in the world (Mammoth Cave National Park). *The countrys deepest lake (Crater Lake National Park).